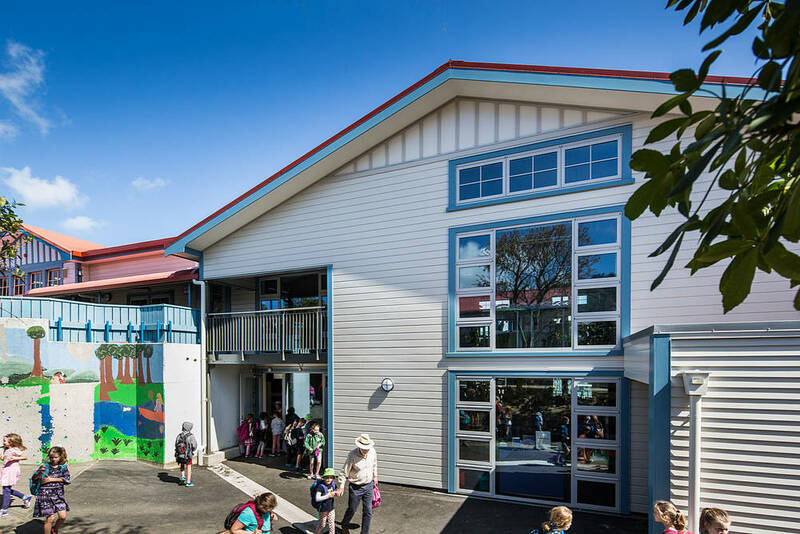 Ngaio School had grown since the early 20th Century from a single building school to a collection of interconnected buildings across a sloping site, supplemented by a village of single storey classroom blocks surrounding the playing field. The central, two storey section of the main (B) block was discovered to be in need of structural upgrade or replacement. 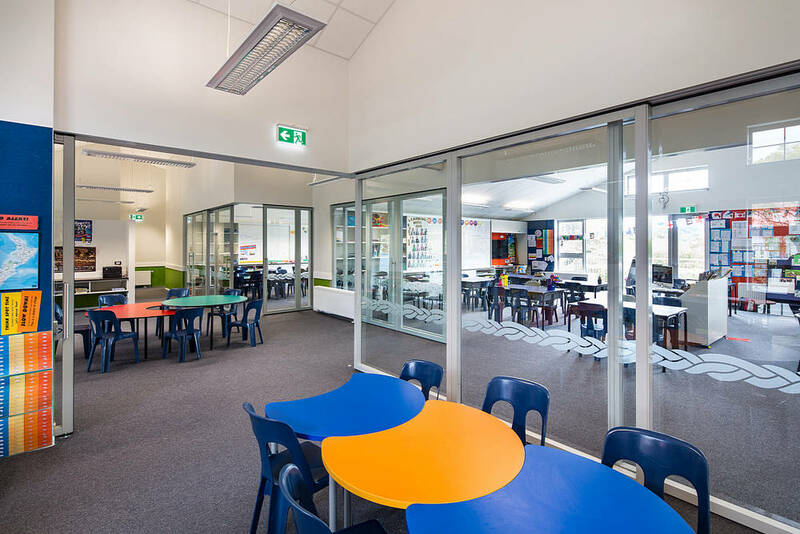 After an initial feasibility study, it was decided to demolish the double height multi-purpose space with classrooms above, and to build a two storey teaching block based on Innovative Learning Environment principles in its place. This block was to be inserted between the existing Admin area on one level and the remaining single storey section of B Block, maintaining the connection between the New Entrants classrooms and the remainder of the school. On each level, the teaching studios are located around a shared central zone, with sliding glass acoustic panels to delineate each space. Resource storage, wet areas and coat & bag hooks are within or adjacent to the central zone. Each teaching studio can be either fully enclosed, or opened up to the shared space depending on activities at any point in the day. 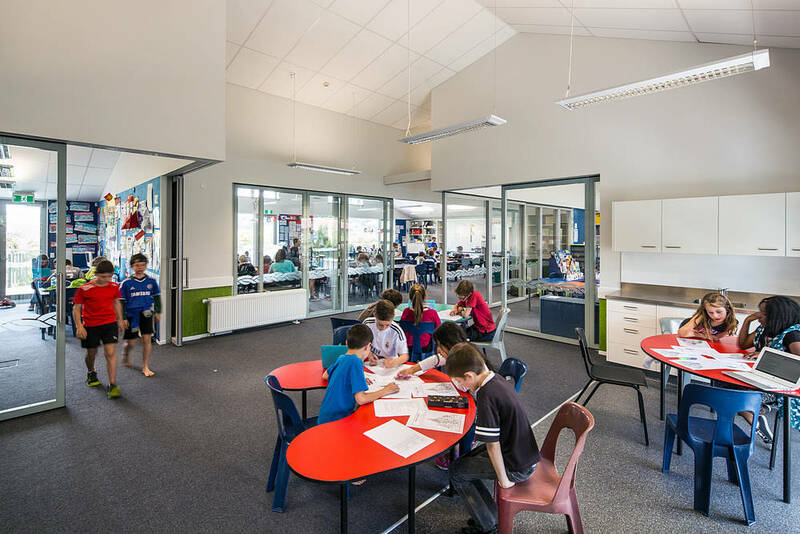 A double cohort studio on each level can accommodate larger syndicate groups if required, but otherwise functions as a two teacher space. The spaces provide flexibility for students to work as groups, as individuals or whole class groups. Each teaching studio is supported by an I-Wall that provides additional resource storage, sliding whiteboards and a wall mounted LCD monitor. Floor boxes throughout the studios further supplement the use of technology by students and teachers. A colour palette of white and grey, supplemented by bold wall coverings provides a vibrant backdrop for the activities within the spaces. B Block has been transformed into a place where the staff and students alike enjoy spending their days and has provided the school with a prototype for future development as they move towards a fully Innovative Learning Environment.